"The beauty of Showtime is the blank canvas approach, with the proud philosophy that no two weddings are the same." 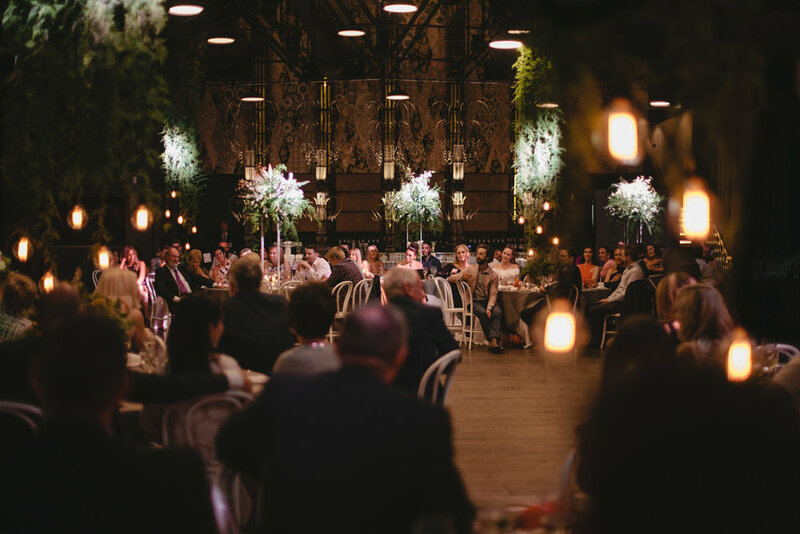 Situated on the edge of Melbourne’s Yarra River sits Showtime Events Centre, a large, glamorous industrial space perfect for your inner-city Melbourne wedding. Showtime continues to push the boundaries and gives their couples an exceptional wedding experience. Showtime Events Centre is one of the many iconic venues that form the larger Showtime Event Group, including sister venue Cargo Hall, and the Old Melbourne Gaol - just to name a few and were voted as Victoria's best reception venue in 2017. We spoke with the team at Showtime and asked them to give us a little more of an insight into the marvellous world of weddings they create and to see what you as a couple can expect from holding your magical day with this outstanding team. Voted 2017’s “Best Reception Venue in Victoria”, Showtime Events Centre is the ultimate embodiment of warehouse industrial glam. Featuring our iconic showstopper bar, original timber floorboards, laser cut LED wall panels and spectacular waterfront views of the Yarra; it offers a setting like no other. With your personal team of professionals to ensure every step of your journey is absolutely unforgettable, Showtime truly offers the ultimate VIP experience. WHAT IS YOUR SIGNATURE STYLE OF WEDDING? The beauty of Showtime is the blank canvas approach, with the proud philosophy that no two weddings are the same. It keeps things exciting, always having new trends and styles to showcase in the space. In saying this, there are a few particular elements that will forever look timeless in Showtime including gorgeous crystal chandeliers and masses of lush foliage – both very different vibes that work oh-so-well! DOES YOUR SPACE CATER FOR CEREMONY AND RECEPTION? HOW CAN COUPLES MAKE THE MOST OF HAVING BOTH PARTS OF THEIR DAY WITH YOU? We absolutely can host ceremonies onsite and offer both an indoor and outdoor option for you. Our riverfront Marquee is a gorgeous setting, which later evolves into your arrival space for drinks and canapés. Our indoor option (which is perfect for Melbourne’s unpredictable weather!) will be located on your dance floor, with the reception completely hidden from guests using removable curtains. After the ceremony concludes your guests shall head out of the venue for a drink in the surrounding bars and restaurants, immersed in the pumping South Wharf village, the curtains come down, and guests return later to experience a completely different space. DO YOU OFFER A FULL WEDDING PLANNING SERVICE FOR COUPLES? Absolutely, we pride ourselves on the full sale to coordination seamless process, with each couple having their dedicated Producer from start to finish. The personal connection built between Producer and couple along the journey is a truly unique bond and a standout difference between Showtime and other venues. GIVE US A LITTLE INSIGHT INTO THE FOOD EXPERIENCE AT SHOWTIME EVENTS? From a team of self-confessed food snobs, Showtime can proudly benchmark our dishes as restaurant quality! All prepared fresh onsite, the Instagram-worthy cuisine is by far the biggest compliment generator we receive feedback on. HOW LONG BEFORE THEIR WEDDING SHOULD A COUPLE GET IN CONTACT WITH YOU TO ENSURE ABSOLUTE PRECISION WHEN PLANNING THEIR WEDDING? Most couples look at booking about 18months prior. In saying this, every couple is different, and we can work around every schedule and timeline. Showtime Event Group have some new and exciting offerings, everything from allowing you to obtain exclusive use of the Old Melbourne Gaol to a complimentary night at the luxurious Pan Pacific Hotel on Melbourne’s South Wharf. New Years Eve weddings are now also a possibility, with fireworks included of course. Showtime Event Group has been appointed by the National Trust Australia (Victoria) as exclusive caterer to the Old Melbourne Gaol. Taking over in February 2018, they are very excited to bring their on-trend approach to venue catering to such a historic site. Wedding guests are able to explore the 96 cells across three floors. The venue can seat up to 100 guests with a sizeable dance floor, or up to 250 guests as standing reception. The Gaol backs on to the Alumni Courtyard proving an outdoor space and is adjacent to the former Gaol chapel, which is available for ceremonies. Following the popular demand over the past few years, Showtime are opening up Cargo Hall and Showtime Events Centre on New Year’s Eve. Their existing packages will stay at the same rates, and they are not applying any surcharges for the premium date. In addition to the impressive and free fireworks show at midnight, supplied by the City of Melbourne. In collaboration with Pan Pacific South Wharf, Showtime Event Group are now including a room night within the wedding package. Strategically situated on the banks of the Yarra River with cityscape views, Pan Pacific Melbourne offers contemporary guest rooms, an array of flexible meeting spaces, dining choices and excellent facilities. Every room of Pan Pacific Melbourne commands panoramic views of the City, Port Philip Bay or River. Each of the 396 rooms is tastefully designed and decorated with all the facilities required for an outstanding guest experience. In addition to the room that we include within the package, wedding guests will also receive a link to book rooms with a 10% discount off the best available room rate. See more of Showtime Events Centre on Mr Theodore.